Approximately one-third of the worldwide production of foods for human consumption is lost or squandered, equivalent to some 1,300 million tonnes each year. This means that enormous quantities of resources allocated for food production are used in vain, and that greenhouse gas emissions caused by producing foods that are lost or wasted are absolutely unnecessary emissions. Foods lost or wasted along the food chain –from planting crops to final consumption in homes– while more obvious in industrialised countries in the residential consumption stage, in low-income countries the foods are primarily lost in the initial and intermediate stages. 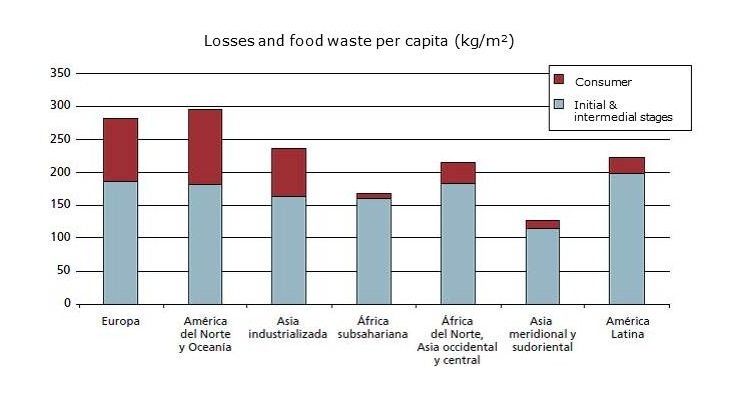 In general, more foods per capita go to waste in the industrialised countries than in developing countries. For European and North American consumers, this figure ranges from 95 to 115 kg/year, while in sub-Saharan Africa and South and Southeast Asia the figure is only 6 to 11 kg/year. In a world with limited natural resources (land, water, energy, etc.) and in which cost-effective solutions must be found for producing enough innocuous and nutritious foods for everyone, reducing food waste must be a priority. The majority of wasted foods are fruits and vegetables. These losses can be substantially reduced by improving conditions along the entire distribution chain in order to improve its efficiency. For industrialised countries, the use of ethylene removal systems during transport and storage is a habitual practice, as there is clear awareness of the effects of ethylene on the ripening process of fruits and vegetables, as well as the advantages entailed in its elimination: fresh products that last longer, waste reduction, better corporate image, etc., resulting in resource optimisation and larger financial profits. The situation is different in the last stages of the chain, at supermarkets and home consumption, where awareness is still lacking on the damaging effects of ethylene on fruits and vegetables and the advantages of using ethylene removal systems. After 20 years in the air filtration sector, Bioconservacion is the leader in providing innocuous solutions for effectively removing ethylene: sachets, filters, machines, etc., during transport and storage. There are studies that reveal that 88% of consumers throw out fresh products before they are consumed, convinced of the need to reduce this level of waste in residential consumption, Bioconservacion invests greatly in R&D, constantly adapting its technology to fresh food conservation, based on the removal of ethylene and the requirements of the residential market. It works hand-in-hand with refrigerator manufacturers with the aim of proposing integrated solutions for their fridges, as well as developing disposable solutions that consumers can put in their refrigerators.